Juliana Ison spent this summer in Santiago, Chile, where she volunteered every week at a daycare in one of the city’s poorest neighborhoods. Juliana Ison has always had a passion for service. Even before coming to Notre Dame, she had already spent 1,000 hours volunteering. 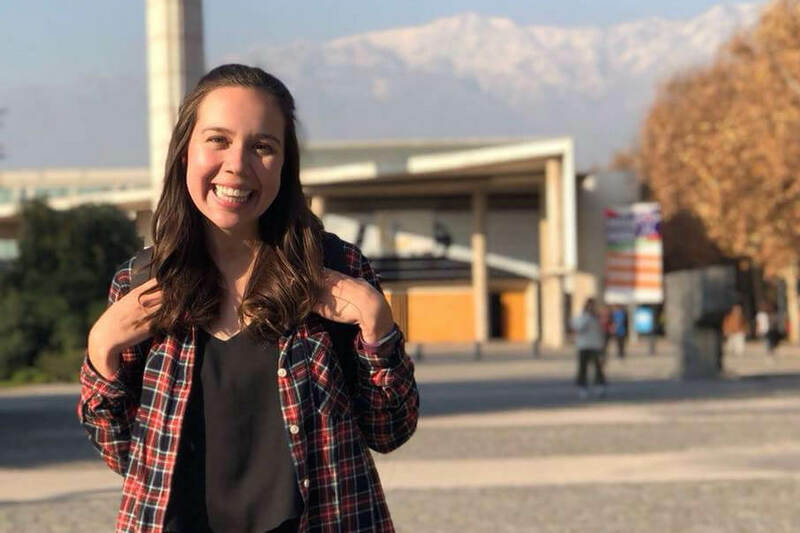 It wasn’t until a service trip to Chile this summer, however, that the senior saw how her majors — psychology and Spanish — could blend with a career path that involves helping others. In her study abroad program, she lived with a host family in a wealthy area of Santiago, a city with one of the largest income inequalities in the world. As part of one of her classes, Poverty and Development, she volunteered every week at a daycare in one of the city’s poorest neighborhoods. There, she saw how economic disparity affects the development of children. Her experience reshaped her worldview and her plans for the future. After graduation, Ison plans to spend the year working as a research lab manager, then hopes to pursue a Ph.D. in developmental psychology and a master’s degree in public policy so she can make a difference in the lives of children like the ones she served in Chile. “I can work on creating tangible change with the research I’m doing, so I can not only work with vulnerable populations but also be able to create change for helping improve their situations,” she said. Ison traces her desire to help people back through two generations. Both of her grandparents were migrant workers — her 5-foot-1, 90-pound grandmother spent long hours carrying 100-pound bags of cotton through fields — yet both eventually earned college degrees in accounting. “Seeing how far they’ve come to really achieving all that they have in their life has given me so much insight, and also has really inspired within me a desire to help others achieve the same goals,” she said. Ison’s heart of service was also shaped by witnessing her mother’s work as a psychologist, where she saw the importance of listening, patience, and kindness. She came to Notre Dame with a tentative plan to follow in her footsteps and study psychology, and her first course in the major only helped her interest grow. “I loved the classes and I became really passionate about it,” she says. The native of Austin, Texas, was initially hesitant about taking a Spanish class, she eventually added it as a supplementary major at the encouragement of a professor, Tatiana Botero. “I realized that Spanish has become a really big part of my life, and it’s in my heritage, too. Really delving into it in college and rediscovering that identity has been super crucial throughout my time here,” Ison said. Ison is clarinet section leader in the Notre Dame Marching Band. 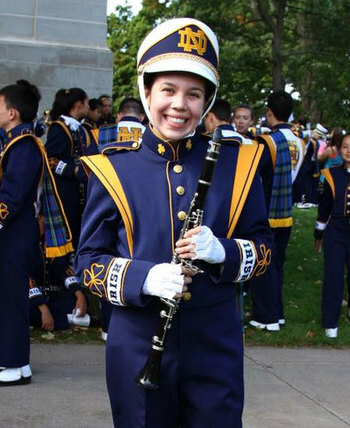 In addition to her majors, Ison is also the clarinet section leader in the Notre Dame Marching Band. Through psychology and Spanish, Ison has been able to discover her identity and purpose, and she is prepared to live them out through her education in the College of Arts and Letters. “It gives a really broad way of thinking about the world, and I’ve gained so much from my education through the process of learning,” Ison said. Ison will take her liberal arts education, her love for service, and the memories of her beloved Chilean children with her as she moves on, aiming to make a difference in the lives of the poor and vulnerable. Originally published by Hailey Oppenlander at al.nd.edu on November 13, 2018.